This documentary, which has already aired in France and Germany, is the work of the French production company Gedeon Programmes and was originally commissioned in 2012 for the Franco-German ARTE network. 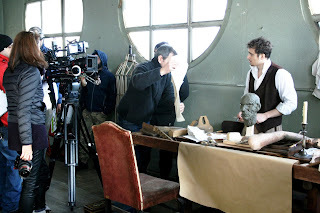 The director is Nina Barbier. Filming began early in 2016. In September 2016 the film was acquired for showing by the BBC, SBS, Sky Arte Italy and Kultura TV. The Beeb's version has been shortened from almost an hour-and-a-half to an hour, and has a different voice-over. The format combines docudrama, with commentaries by historical experts. Nina Barbier originally fancied Tidla Swinton for the role of Madame Tussaud, but in the event - no doubt for reasons of economy - the filming (directed by Alain Brunard) took place in Bucharest using Romanian actors. I suspect historical dramatisations are really difficult to make convincing, especially on a limited budget. The costumes and props are well-designed in this one, even if everything is a bit too spacious and clean. Nina Barbier was also able to assemble an impressive cast of historical experts. 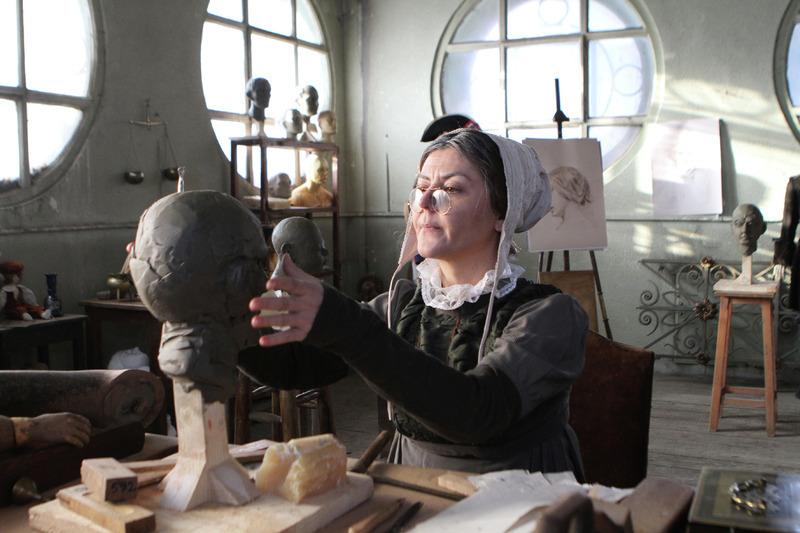 The consultant on the programme was Pamela Pilbeam, Emeritus Professor of French at Royal Holloway, and author of Madame Tussaud and the history of waxworks (2003) Also featured is Kate Berridge, a freelance writer, and author of the refreshingly sceptical biography, Waxing mythical (2006). The two English ladies are nicely counterbalanced in the early part of the programme by the French academic Antoine de Baecque, who is both Gallic and fashionably hirsute. As Nina Barbier herself explains, the programme's primary focus is Madame Tussaud's achievement as an entrepreneur and "pioneer of the leisure industry", her business and marketing strategies and, ultimately, her metamorphosis into a British "national treasure". 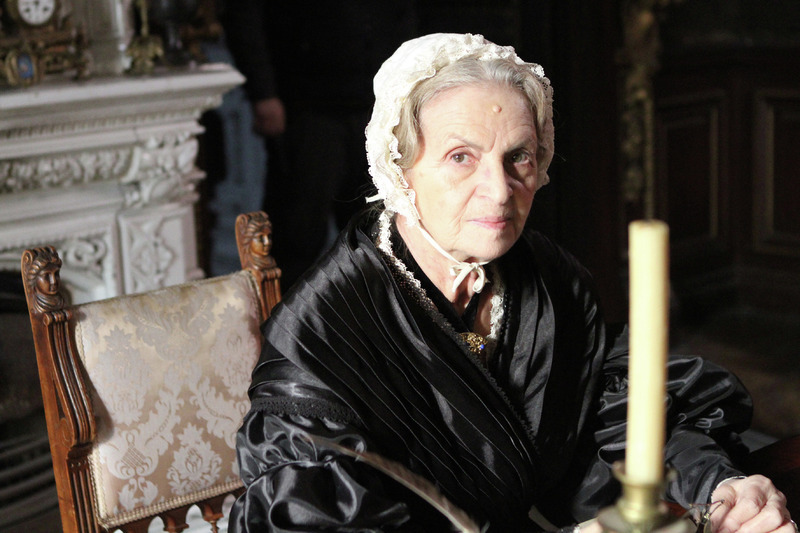 The film follows her through her early apprenticeship in pre-Revolutionary France, her emigration to London, her years in the fairs and public venues of the English provinces, and finally the creation of permanent premises in Baker Street in 1835. She was, says Nina Barbier, "sculptress, fairground showman, designer of publicity and businesswoman", but above all "the creator of her own legend". The second part of the programme, which deals with the development of the Tussaud empire in England, the business strategies employed and the marketing of the waxworks, is relatively sophisticated, and is particularly strong on the importance of the early English fairs. The first part, on Marie Tussaud's early life in France, is less convincing, though this is perhaps inevitable given the lack of sources apart from the Tussaud memoirs. Here is a transcript and some notes on the first part of the film. The basic format consists of dramatic sequences and the occasional short location sequence combined with third person narrative and filmed commentary from the various historians. There are lots of quotes from the Tussaud Memoirs (with suitably dramatic shots of the elderly lady dictating them). Narrator: At the age of nearly eighty a remarkable woman set out to dictate her memoirs. 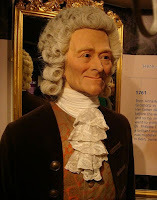 Madame Tussaud was born in Berne in 1761. In an astonishing life that spanned both the French and Industrial Revolutions this extraordinary mother and entrepreneur travelled across the Channel to England to create a unique brand based on famous people modelled in wax. Determined to leave an account of who she was and the times she lived through, her memoirs, letters and papers offer a unique insight into the creation of the world-famous empire which bears her name: Madame Tussaud. Pamela Pilbeam: Madame Tussaud was, I think, an amazing business woman. Modeller at Tussauds London: To me Madame Tussaud represents a creative force. Antoine de Baecque: She was an artist, but she was also at the centre of power. KB: But what she said about her life is not necessarily the truth, so I feel that in her hands, the truth itself is as molten as wax. 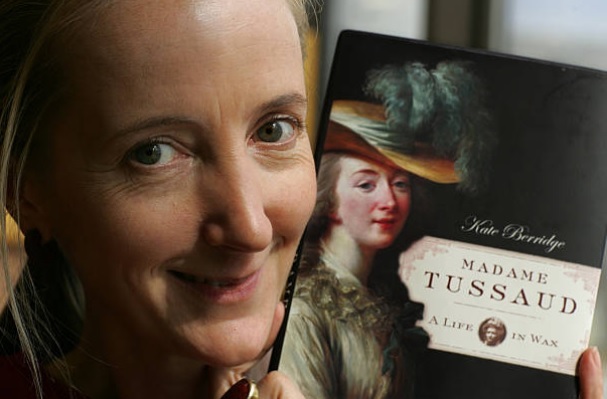 "Her father, who died before her birth, was of the military profession, and his name, Grosholtz, was renowned"
Kate Berridge: Marie Tussaud seemed to mind about her social status to the extent that she rather embellished her family background. So, for example, even something as straightforward as place of birth, and parentage, as presented by her, proves to be incorrect. Narrator: Marie Tussaud's story begins in Strasbourg, not the well-to-do Berne as she claimed, where she was born into a far from illustrious family. Claude Muller, Strasbourg historian: The Grossholtz were a marked family because of the profession followed by its men and boys. These men were sons of executioners. As the profession was passed down from father to son, the son of an executioner had to be an executioner himself. For the daughters of executioners it was the same. Unfortunately for them, they could only marry sons of executioners. Marie Grossholz had no other option to get on in life, but to hide her origins. Madame Tussaud's certificate of baptism (shown on the programme) is one of very few independent documents to survive concerning her life. She was baptised Anne Marie Grosholz on 7th December 1761 in the Catholic church of Old St. Peter's, Strasbourg. Her parents were 18-year-old Anna Marie Walter (born in Strassbourg, 4.10.1743) and 45-year-old Johann Joseph (born Brechlingen, Wasselonne, Alsace, 16.02.1716). Members of the Grosholtz family had been public executioners in Zurich since 1473. Marie's grandfather and great grandfather were previous executioners in Strassbourg and a great uncle followed the same profession in Baden Baden. What about Marie's father's military service? According to the Memoirs he was an adjutant to the Austrian field marshal Dagobert Sigismund von Wurmser during the Seven Years War and died, two months before her birth, having been "so mutilated with wounds, that his forehead was laid bare, and his lower jaw shot away and supplied by a silver plate". This seems unlikely, although it is interesting to note that comte von Wurmser was a native of Strasbourg. Narrator: When Marie's father died before she was born, her mother turned for support to her brother-in-law, a local doctor and anatomist turned wax modeller in Berne. Kate Berridge: Philipp Curtius is crucial to her story for the following reasons. He employed her mother as a domestic housekeeper. He became very attached to the young girl, and her clearly taught her her skills. Narrator: Philipp Curtius was something of a celebrity in Berne. He was consulted for his medical and anatomical knowledge, and his wax models were very much in demand. Pamela Pilbeam: Philipp Curtius had learned anatomy and taught himself to make wax anatomical models because in the mid-18th century it became less easy to secure dead corpses to chop up. So people started to make wax models to learn about anatomy and to teach about anatomy. There is no independent evidence that Curtius ever trained as a doctor or made anatomical waxes. Nor is there any documented connection with Berne. (His presence there provides a convenient link to the prince de Conti, who visited Rousseau at Montmorency in 1763). In contrast he can be securely placed in Strassbourg in 1759 or shortly afterwards. Since Curtius was only a few year's older than Marie's mother, it seems quite likely that Marie was his natural daughter. "During that period, modelling in wax was very much in vogue. Representations were often most beautifully executed, and to such perfection." Pamela Pilbeam: So Marie, as a small child in Paris, watched Curtius; he allowed her to try out working with wax, found that she was a very apt and quick learner and taught her the trade. Kate Berridge: He was an extremely accomplished modeller, and the tinting of the wax so that it replicated flesh, he passed that skill on to her, so she was an apprentice, almost, to this enigmatic man. Narrator: As his fame grew Curtius decided to open a second exhibition in the Boulevard du Temple. Antoine de Baecque: The main place where Curtius developed his worldwide reputation was the Boulevard du Temple. The major attraction, which brought in large numbers, was the Cavern of Thieves, murderers and great criminals of the time. 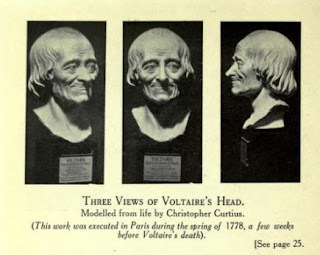 Narrator: Alongside the criminals Curtius placed busts of the celebrities of the day, a formula that would later make Marie Tussaud world-famous herself. The French version includes a little more detail about Curtius's establishments, but the chronology is still muddled. His original waxworks was in the boulevard du Temple; it was his second exhibition which was in the Palais-Royal. This opened in 1784, when the arcades of the Palais-Royal were first constructed. The chronology is significant as the Palais-Royal cabinet clearly represented a bid to appeal to a more exclusive, fashionable clientele. 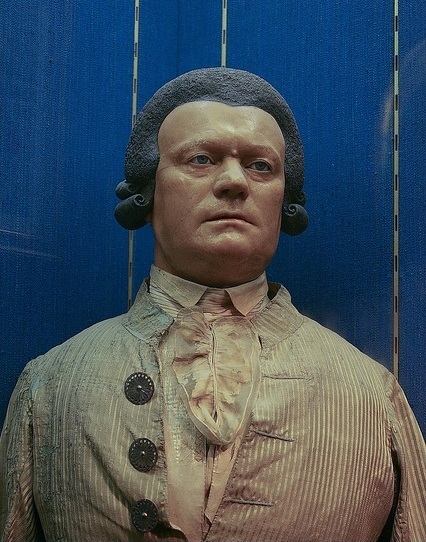 According to Theresa Ransom, Madame Tussaud (2003) p.5, the confusion arose because of a letter in the Tussaud Archive to Curtius from his lawyer in Germany, dated March 1776 and addressed to "Palais-Royal-Côté de l'Avenue de l'Opera par la Cours Desfontaines". We do not know whether this address represents an early business premises, but, if so, it should not be confused with the famous salon de cire. "During Madame Tussaud's residence with her uncle she had early imbibed the greatest taste for that art in which he so much excelled"
"To her was confided the task of taking casts from the heads of the principal characters of that period who most patiently submitted themselves to the hands of the fair artist"
"The cast that she took from the face of Voltaire was only two months before he died"
Narrator: There is only one surviving example of the wax models made by the young Marie, at the musée Carnavalet in Paris. Philippe de Carbonnières, Conservator: Here is the bust of Philipp Curtius, probably made by his niece Marie. It is a perfect representation of the type of portrait you could see in these exhibitions. Paainted to look natural, the face is in wax, using realistic colours. The eyes are glazed and the clothes are real. Antoine de Baecque: For several years, Curtius lived the life of a sort of society chronicler. He sculpted portraits of celebrities of the time. Man in court circles, many of the greatest people in the kingdom. He came to speciallise in what Curtius called the "high table" - the monarch's meals. A certain Sylvestre, an ingenius sculptor, was the first to develop the technique of making a wax portrait. Here is how: He placed two little tubes in your nostrils, two more in the corners of the mouth; he rubbed your face with oil and covered it with a very fine layer of plaster. Once dried the plaster retained a imprint; wax could be poured in and a model formed. He would then colour the heads and add eyes the same colour as the originals, so that the busts were a perfect likeness. Tableau du nouveau Palais-Royal (1788), p.96-7. There is no evidence for MadameTussaud's creation of the Voltaire waxwork, at age fourteen, apart from the Memoirs. The Romance of Madame Tussaud (1920) includes an illustration of a head of Voltaire which is described as "modelled from life by Curtius". 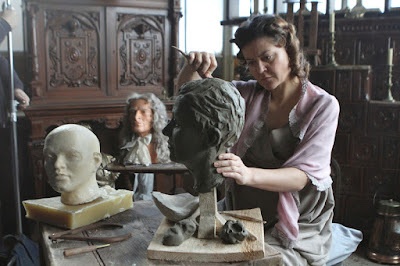 The mould is still used in the contemporary times (When I visited Madame Tussauds in 2012 Voltaire stood completely unlabelled next to Louis XIV and Marie-Antoinette like some geriatric pageboy.) The model is accomplished but not necessarily "from life". It is similar to the bust by Houdon (who really had made a life mask) but not, I think, quite identical; Houdon's statue was available to view on public exhibition and there were many copies made, both licit and illicit. Narrator: Now an accomplished model maker, Marie was fully involved in the making of the waxworks. As her skills increased, so too did her reputation, at least according to her memoirs. "Among the members of the Royal Family who would often call in at the apartments and admire Curtius's works and those of his niece, was Madame Élisabeth, the King's sister. Wishing to learn the art of modelling in wax, she asked the young Marie to teach it to her. The Princess ended up liking her so much that she asked Monsieur Curtius to permit her to join her at the Palace of Versailles - so she could permanentlly enjoy her pleasant company." Kate Berridge: This seems extremely unlikely. She appears nowhere in official records: Marie Grosholtz, the name is nowhere. Even a cursory look at the formality of this very codified and controlled hierarchical system which was the household - someone who was making money out of a commercial exhibition with Curtius, would never have access to that intimate circle. But it is very amusing in her memoir because she says things like "The King said to me, 'Don't get up, my dear.'" Well, you know, again, this is extremely unlikely, to put it mildly. Narrator: The memoirs then take a dramatic turn. The young Marie's life was about to be turned upside down. "Few events in history have ever caused so intense and permanent a sensation throughout Europe as the French Revolution of 1789. The records of this short but exciting period teem with examples of the most diabolical ferocity"
"The first event that may be cited as the sanguinary commencement of the Revolution Madame Tussaud but too well remembers. The public began to assemble in the streets, demanding the busts of the idols of the people... They were persuasive petitioners whose appearance was certainly such as plainly indicated they were not to be denied. "They were persuasive petitions, whose appearance was certainly such as plainly indicated they were not to be denied"
Citizen Curtius? A message from the Assembly: "Comrade Curtius is requested to produce immediately new waxwork bust of the deputies of the Constituent Assembly"
Pamela Pilbeam: This was the way in which people knew what was happening in the Revolution. It was a bit like the ten o'clock news on television today. Instead of having that, you would go to a wax exhibition to see who was in charge now in the Revolution. It was a fast-changing environment as well. So he had to keep swapping their heads around. Narrator: In January 1793 Louis XVI himself was guillotined. In March the Revolutionary Tribunal was created. In September the Reign of Terror began, with mass executions plunging France into a bloodbath. A decapitated head would be immediately taken to Madame Tussaud whose feelings can be easier conceived than described. Shrinking with horror she was compelled to take a cast. Pamela Pilbeam: Marie tells us in her memoirs, how she sat on the steps of the exhibition, making wax models of decapitated guillotined victims of the Revolution. It sounds amazing that Marie could do that. And you think, this is a tall story. Load of rubbish. But actually, it's substantiated by accounts that other people gave. And we know that the exhibition did, indeed, include wax models of the decapitated revolutionaries. And somebody had to make them. And who was going to make them if Marie didn't? Although in her memoirs Marie claims to have been forced to make death masks of the executed, no doubt the grisly displays of the most famous victims would have attracted even more appreciative crowds to her exhibition. Marie was ever the opportunist. Kate Berridge: This was all part of a very elaborate self-propaganda of suffering and hardship. She very much casts herself as the victim of terrible, terrible trials. And imprisonment and being forced to have bloody heads on her lap to make models of. Also she gave people, through her own account, a vicarious experience of proximity to celebrity. And it's that vicarious experience of proximity to celebrity that's the foundation of the whole thing. Our two historians do not quite agree here! I think Kate Berridge is right - there is no need to imagine the account of Madame Tussaud modelling from guillotined heads is literally true. It is interesting how early in the Revolution Curtius exploited the frisson of bloodied heads "taken from life". 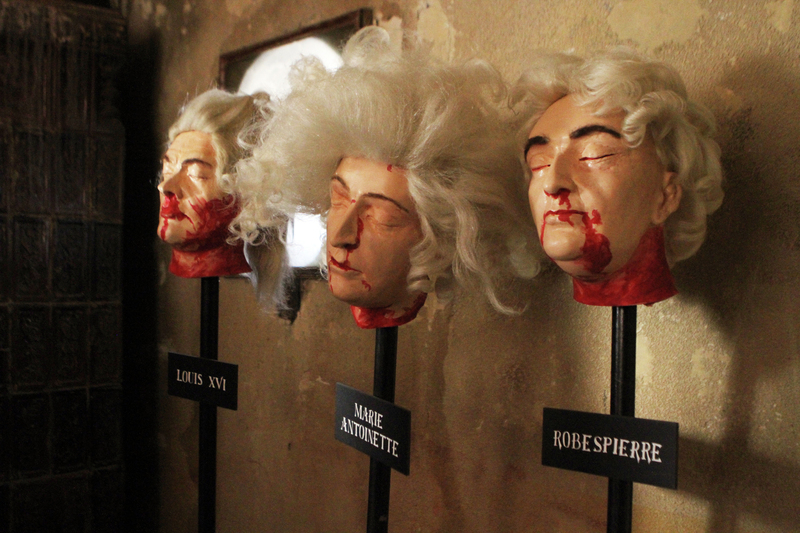 According to one unsubstantiated account on the 14th July the severed heads of de Launay and de Flesselles were brought to Curtius to be modelled as wax busts for his Caverne des voleurs. The wax heads certainly existed, for on 20th September they were advertised at Philip Astley's circus on tour at the Royal Grove, Westminster Bridge, London. Mr Astley has brought with him finely executed in wax by a celebrated artist in Paris, the heads of Monsieur de Launay, late Governor of the Bastille, and M. de Flesselles, prévôt de Marchands of Paris, with incontestable proofs of their being striking likenesses. Narrator: In 1794 Robespierre, chief architect of the Reign of Terror, was himself guillotined. The country was at war, both internally and beyond its borders. As the chaos in France worsened, Marie's uncle was called up to serve as a translator with the French army. After a few months Curtius returned very ill. He died shortly after, leaving Marie as his sole heir. Pamela Pilbeam: Curtius left his entire estate to Marie, which meant a house in Versailles, and the Boulevard du Temple establishment (The Palais-Royal having gone, you see.) And Marie became then the chief of the business. Testament of Curtius, DQ10.521, Archives de Paris. See Berridge, Waxing mythical, p.161: The will is dated August 1794. Curtius, who describess himself as "painter and sculptor of Paris", names as his principal beneficiary "Citizeness Anne Marie Grosholtz, spinster of full age, my pupil in my art who has lived with me under my roof for more than twenty years". Left her "everything that the law allows me to give, in view of my not having an heir". He denied any relation of kinship, "I do not have, or know of, any female heir either in France or in a foreign country".